PLAYAS DE TIJUANA, B.C. – It’s a bucolic, sunny Saturday afternoon in Playas de Tijuana. As we sit in the shade of the patio sipping our cold, house-made sangrias, the clink of metal on metal resounds in the courtyard, followed by an excited cheer from one person and a simultaneous groan from another. We laugh and set our drinks down, stepping up to the gravel-covered pétanque terrain to take our turn in the round robin tournament. A boules game with roots in 6thcentury Greece, the game of pétanque, as we know it today, was first played in France in the early 20thcentury. 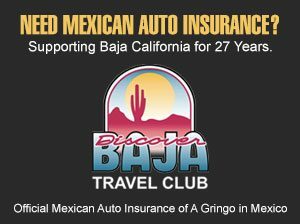 In recent years, it’s become a popular pastime in Mexico City and is beginning to catch on in Baja California. 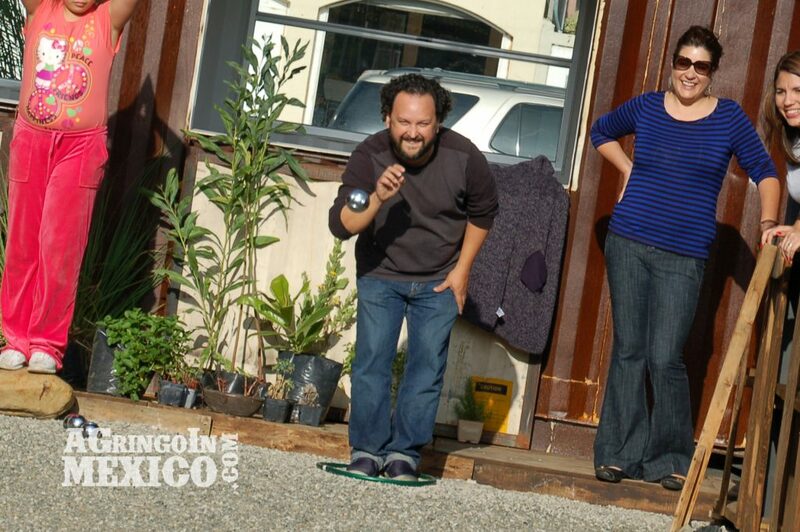 The Petanquero Bistro in Playas de Tijuana is one of the first establishments to introduce the game here. “It’s a game that gets even more fun when you’re having drinks,” the Bistro’s smiling owner Brau Zapa confides. “We built Petanquero Bistro as a great place to come with your friends for an afternoon playing the game and enjoying good food, sangria or a beer.” The outdoor venue features a mid-size kitchen and small staff that prepares tasty burros, wraps, soups and a number of other botanas. We tried the burro sampler and found the food to be fresh, healthy and thoughtfully presented. 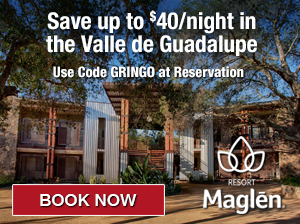 I’ve always been impressed with the “can-do” attitude of Tijuana’s restaurateurs, artists and entrepreneurs, and the way that they make use of reclaimed materials and a touch of imagination to create modern, rustic and inexpensive spaces. 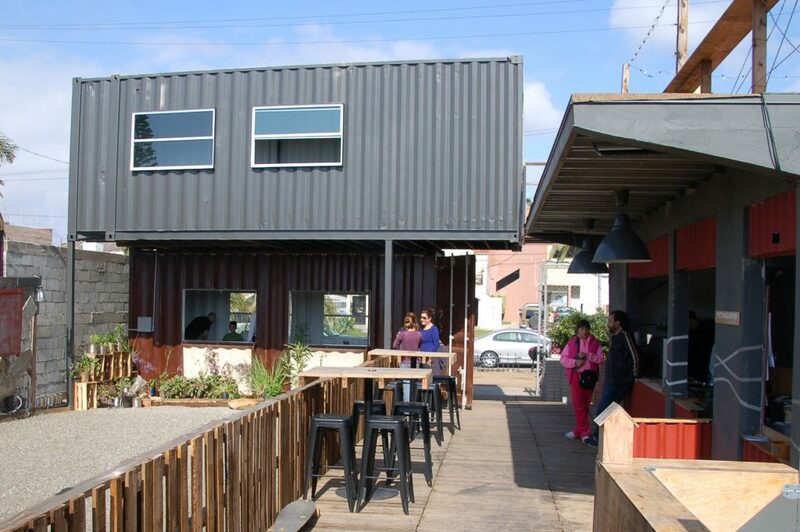 The main structure on Petanquero Bistro’s property is a shipping container cut in half and fashioned into a two-story dining room and soon-to-be studio — both Zapa and his partner Elizabeth Velasco are designers by trade. Petanquero is built of reclaimed materials. Pétanque is played by two teams of two or three players each, and played by larger parties in tournament style. To begin the match, a small wooden ball, called the jack, is thrown out onto the terrain. Each player must then stand in small circle with feet together and throw a baseball size boule, a hollow steel ball, landing it as close to the jack as possible. Whichever team has the closest boule to the jack “has the point”. The other team continues to throw until they have a boule land closer or knock the point off the jack. As there were six of us, we played a round robin pétanque tournament with three teams of two players each. The rules get a little more complex the deeper you get into the game, with boules of varying distances from the jack achieving different points. And just when you think you’ve got the point comes the metallic clink of your opponent’s boule, knocking yours out of the running. San Diego’s Román González tosses his boule onto the terrain. In addition to the game, Petanquero Bistro also plans to have movie nights, projecting films onto a large blank wall next to the pétanque terrain. The space is a work in progress and Brau and Liz are also building a rooftop patio with additional seating, allowing a nice view of the neighborhood. 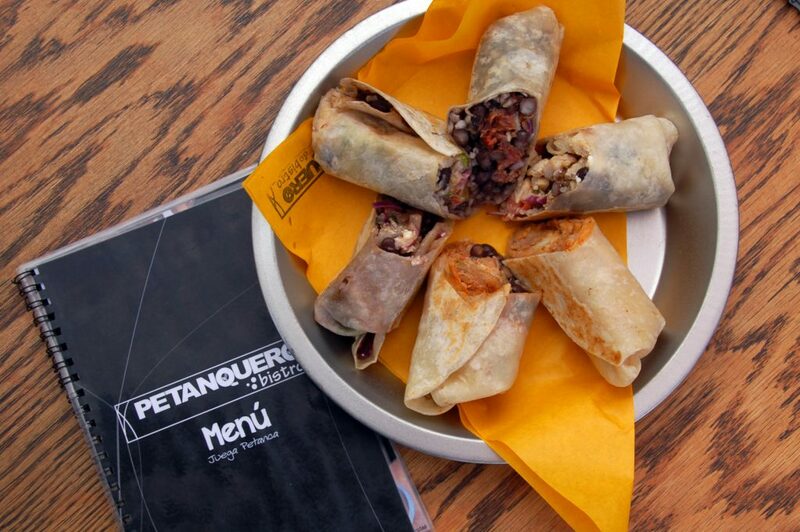 Petanquero Bistro is located at Paseo Ensenada 795, 22500 Playas de Tijuana, Baja California. +52 664 609 9108, Facebook: Petanquero. Terrain reservations are suggested.